Liminka Bay lies on Finland's western coast, in the Bay of Bothnia. The city of Oulu is just to the north. The bay is one of Finland's best birdwatching areas with the Liminganlahti Bird Sanctuary (WWF funded) at its heart. The best times to visit are May and August and September when migration is in full swing and wildfowl and waders are most numerous. There is an excellent information centre (see photo) which is well signposted from the nearby main road by Liminka village. 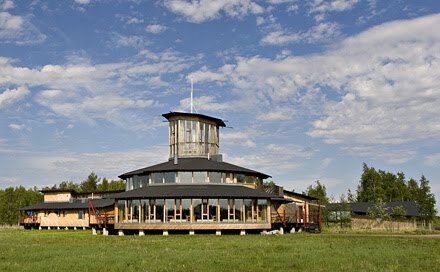 Several trails and board-walks with birdwatching towers run from the centre and guides can also be hired. There is also hostel-type accommodation here. The Blue Whale Balaenoptera musculus is found in all the oceans of the world, though it is not as widespread as it once was. Sadly, whaling took its tool on this magnificent beast. It has been officially protected since 1967. Blue Whales summer in warmer regions, where they breed, and winter in cooler temperate and polar regions. 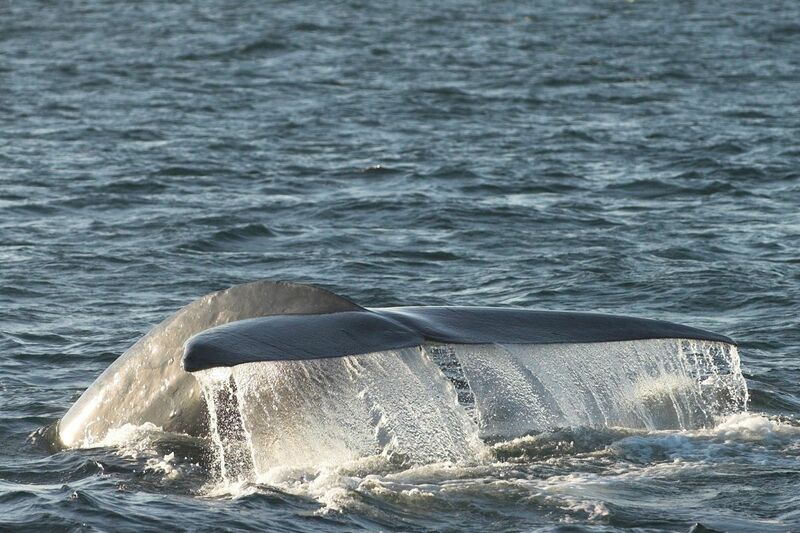 The Blue Whale is the largest animal on our planet but feeds almost totally on tiny crustaceans. 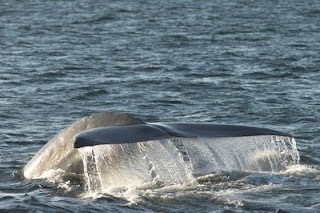 To see Blue Whales it will probably be necessary to join an organised whale-watching cruise. New Zealand is a unique wildlife destination that has a remarkable range of landscapes and habitats from the sea to Alpine-uplands. The islands are also home to many endemic species such as the famous flightless Kiwi (2 species in fact). 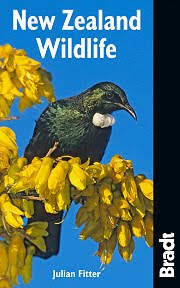 Bradt's New Zealand Wildlife guide provides an ideal overview of the wildlife of this fascinating archipelago. There are main chapters on The Land, Habitats, Birds, Mammals, Reptiles, Amphibians and Freshwater Fish, Invertebrates, Plants and Fungi and also useful Where to Go and Further Information sections. Indeed author Julian Fitter has crammed a mass of information into just 192 pages. The book is also lavishly illustrated by over 180 colour photos and a dozen maps. 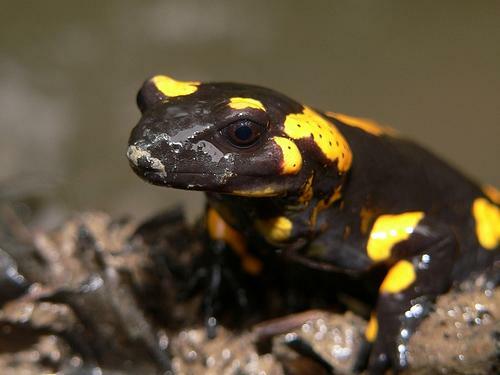 The Fire Salamander Salamandra salamandra is a handsome amphibian found in continental Europe. It mainly inhabits damp deciduous woodlands, usually in uplands and often by streams. Adults can reach 25cm in length and vary in colour and pattern. Most are black with bright yellow spots and stripes, though some are the opposite, being mainly yellow with black markings. Fire Salamanders are mostly nocturnal though they can be seen in daytime when crossing tracks and roads during or after rain. The Galapagos Islands are one of the world's most top wildlife destinations. Almost anyone who visits these unique islands, in the Pacific Ocean off the west coast Ecudaor, goes there to see the wildlife. The islands are well covered by guide books and literature on the species living there and thus reading-up and preparing for a trip is relatively easy. 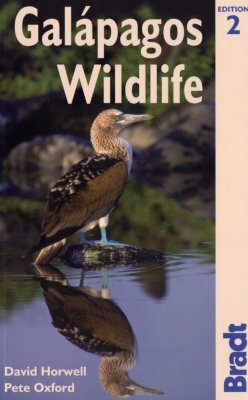 The simply named Galapagos Wildlife by David Horwell and Pete Oxford is a colour-photo-packed volume in the Bradt Wildlife Guides series. 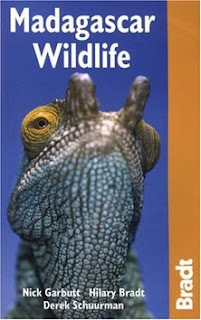 There are chapters on all the main animal groups (Invertebrates, Reptiles, Birds, Mammals), and on Habitats, Plants, The Seashore, Underwater and Conservation. Tips on on getting there, landing and visiting are accompanied by clear maps (120 in total) for the key areas. All this and more is crammed into just 144 pages, ideal for hand luggage and for slipping it into ones pocket once there. ISBN 1 84162 100 5. 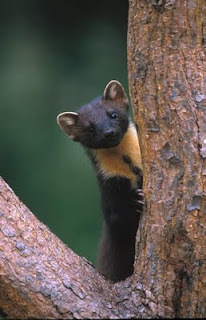 The Pine Marten Martes martes is a Mustelid: a family of small carnivores that includes weasels, minks, polecats and otters. They occur over much of Europe in mature woodlands, often areas dominated by conifer. They are often locally common but, besides being mostly nocturnal, they are often wary of humans and hence not always easy to observe. Pine Martens can be separated from their close relative the Beech Marten (aka Stone Marten) by its yellow throat (Beech has a white throat) and longer ears and legs. Photo courtesy of Heatherlea. The unmistakable Polar Bear Ursus maritimus is an animal just about everyone wants to see. They live in the Arctic region with populations in Canada, Alaska, Greenland, Russia and islands off Norway. And you can see them in the wild, with several destinations geared up to getting people up close, in safety, to this magnificent creature. Two well-known Polar Bear watching places are Churchill, Manitoba in Canada and the Svalbard archipelago between Norway and the North Pole where around 5000 Polar Bears are said to live. 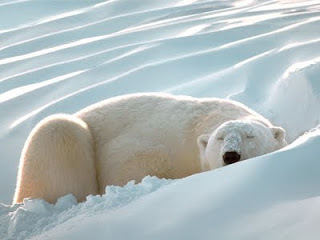 Here is a great site with all you need to know about Polar Bears including a list of responsible tour operators. 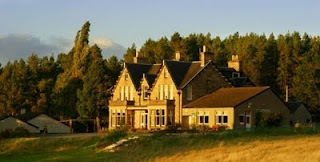 This 3-star hotel in Nethybridge, Inverness-shire, Scotland, is a great base from which to explore the Cairngorms National Park and Speyside. It is owned and run by Heatherlea Birding and Wildlife Holidays who have a range of expertly guided excursions to see the likes of Capercaillie, Black Grouse, Ptarmigan, Dotterel, Slavonian Grebe, Golden and White-tailed Eagles and Corncrake. Mammals in the area include Otter, Pine Marten, Wild Cat, Mountain Hare and Red Deer. Longer trips to the Scottish coast and islands focus on seabirds as well as cetaceans. 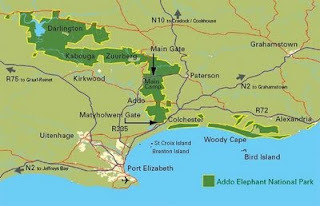 Addo is conveniently situated near the Garden Route on South Africa's Cape (see map). The park was established to save the last herd of African Elephants that hung on in the region in the 19th century when all around had been shot. It's an easy park to explore with good, well marked driving routes, decent accommodation, a flood-lit waterhole and daily wildlife drives with rangers. There are only a few Lions here and indeed few other big predators but plenty to see including Buffalo, Black Rhino, Plains Zebra, Greater Kudo, Red Hartebeest, Impala, Warthog, Suricate and, of course, plenty of African Elephants. An endemic flightless Dung Beetle is another star turn at Addo and so piles of elephant dung on the roads here should be carefully driven around! This is another beautiful book from Bradt packed with colour photographs of 275 species. Madagascar Wildlife is great background reading on the unique fauna of this remarkable island. Almost 300 species are covered, including, of course, the famous lemurs but also many incredible birds and insects. Newly discovered species and recently protected habitats are all dealt with, too, and practical advice on visiting the key national parks and reserves. There are also special features on the evolution, camouflage, night-time wildlife and conservation. Though rather slim (at 176 pages) authors Hilary Bradt, Nick Garbutt and Derek Schuurman have put together a superb practical guide. ISBN 978 1 84162 245 3. The Krka National Park lies in Central Dalmatia, in Croatia, along the scenic, often rushing Krka River. Krka is home to a good range of reptiles, such as Hermann's Tortoise, Moorish Gecko, Balkan Green Lizard, Dalmatian Wall Lizard, Dalmatian Algyroides, European Glass Lizard and Leopard Snake. Common birds include Yellow-legged Gull, Scops Owl, Cetti's and Subalpine Warblers, Spanish Sparrow, Blue Rock Thrush, Western Rock Nuthatch and Cirl Bunting. Pygmy Cormorants are increasing and Rock Partridge not uncommon. In summer Rufous-tailed Rock Thrush can be seen. Raptors include Short-toed and Golden Eagles. In summer butterflies, such as the endemic Dalmatian Ringlet, abound and dragonflies hawk over the numerous waters. In peak holiday periods the areas around the waterfalls here can be crowded, so best to visit "off-peak" or on a working day. Also, beware of going "off the beaten track", meaning walking off marked trails as there are areas here where mine-fields have yet to be cleared and some places are not well marked. 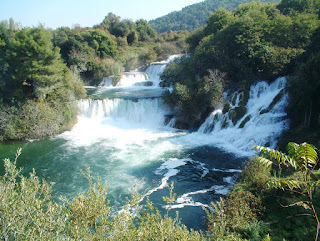 Krka NP lies just inland from Sibenik, just over an hour from Split. 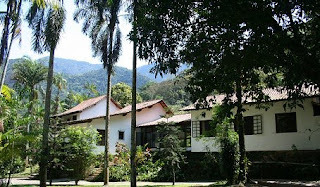 Serra dos Tucanos is an excellent small lodge within the Tres Picos State Park, south-east Brazil. This is a great base from which to explore the Atlantic rain forest where over 100 endemic birds occur - around 200 species have been seen in the lodge's grounds! Serra dos Tucanos caters specifically for birdwatchers, but naturalists and nature-lovers of all kinds are very welcome. There are landscaped gardens with two small rivers winding through them and adjacent rain forest where an array of flowering and fruiting trees attract a rich fauna including hummingbirds, tanagers, parrots and toucanets. When it rains many of these birds can be watched close-by at feeders on and near the veranda. Thus this is a great lodge for photographers. The en-suite rooms are pleasant, there is an outdoor swimming pool and traditional meals are prepared on site. All in all, this is a fine birding lodge. This fact-filled book is the only English language guidebook devoted to this small central-eastern European country. First published by Bradt in 2007 it is written by Lucy Mallows, who lived in Slovakia for several years. It is impeccably researched and a must for all visitors to the country including those who love the outdoors and those in search of wildlife. It is also lavishly illustrated with colour photos. ISBN-10: 1 84162 188 9. The Wolf (aka Grey Wolf) Canis lupus is surely one of the most noble animals on the planet. Seeing a real, live, wild Wolf is not easy. In some parts of the world, for example in Canada, Russia and Romania, they are not as rare as they once were, however they are wary creatures, usually keeping well away from humans. Some tour companies organise wolf tracking and watching tours (in N America, Poland, Romania, Finland, Spain, etc) and joining one of these is often the best way to maximize one's chances of seeing this carnivore. 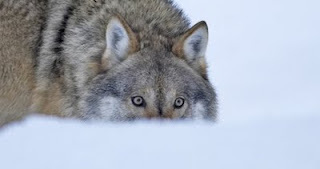 Yellowstone National Park in the USA is one of the few places were wolves are possible to observe without joining a tour, though even here up-to-date local information will still be needed.